A Spanish-led police operation has cracked a racket in horsemeat unfit for human consumption, the EU's police agency Europol says. Police in Spain made 65 arrests for crimes including animal abuse, forgery, money laundering and racketeering. Horses in Portugal and Spain deemed unfit for consumption were slaughtered and their meat passed off as edible. A Dutch businessman arrested in Belgium is said to have controlled the illegal trade from south-west Spain. He was first sought in connection with a scandal in the Republic of Ireland in 2013, when horsemeat was found in beef burgers, but his whereabouts were unknown at that time. The issue in the earlier scandal was one of food fraud rather than food safety. 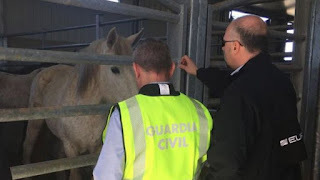 Spain's Guardia Civil (police) began Operation Gazel a year ago after detecting unusual behaviour in horsemeat markets. They worked in co-ordination with Belgium, France, Italy, Portugal, Romania, Switzerland and the UK, Europol said in a statement. The unnamed Dutchman controlled the crime ring from Calpe in Alicante, on Spain's Costa Blanca, "putting his most trusted men in charge in every country affected by the scam", Europol says. Police carried out raids in both Alicante and Leon, in the north of Spain, blocking or seizing bank accounts and properties, and confiscating five luxury cars. Other charges brought against those arrested were perverting the course of justice and committing crimes against public health.